A ceiling fan is a must have for every home. In fact, this fixture should be installed in almost every room of your house as it’s extremely efficient in providing comfort. The most important benefit offered by this device is that it helps you save a lot of money on air conditioning. However, shopping for the best rated ceiling fans can be a bit difficult today as there are so many of them, it’s hard to choose which one is perfect for you. This guide will offer some tips on how to determine the right fan for your room and provide detailed reviews of the best models available on the market. When you know what to look at when studying the product details, you would be able to pick a device that truly meets your needs best. There are many great ceiling fans on the market. However, be sure that you are making a wise choice as even the highest quality device might not be able to meet your expectations if it doesn’t fir the requirements of the space. The general rule of thumb is that the bigger the room, the bigger fan you’ll need to keep it cool. However, a few top-of-the-line fans available today bend these limitations with powerful motors and special blade curve design, so you’ll need to check the product details. Small rooms up to 75 square feet would be well-equipped with a 36-inch fan, but if your room is over 225 square feet, you should look into 50-inch models or bigger. For maximum efficiency, a fan must be placed about 8-9 feet off the floor. Years ago, when fixtures were equipped with standard rigid mounts, this was a problem as you had to look for a fan with a mount of the exact right size. Nowadays, best rated ceiling fans have three options of mounts from flush up to a long piece for rooms with over 10-feet ceilings. This is a factor that truly matters as the fixture must enhance the look of the room. Fans today are available in a variety of colors and styles, so take your time studying different options. 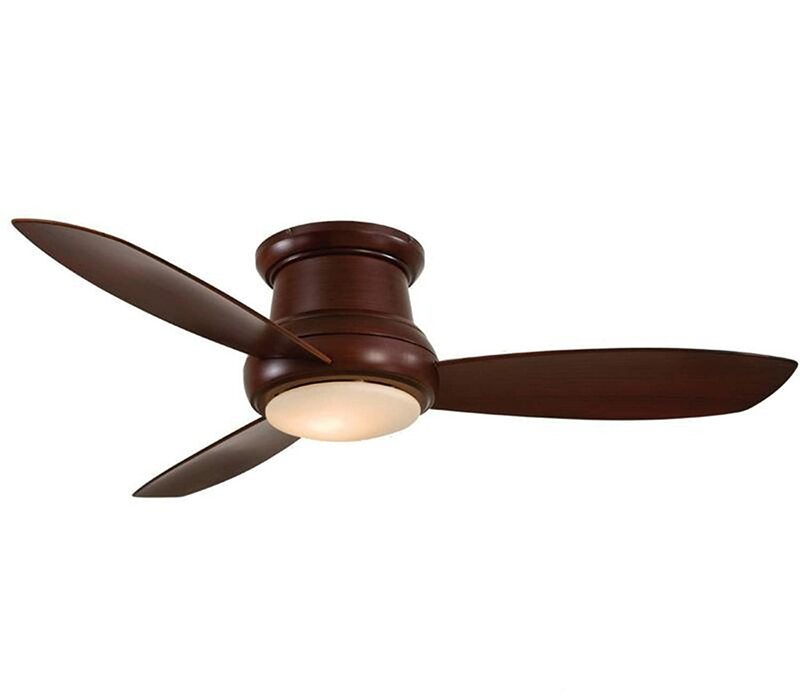 Hunter Fan Company has been one of the leaders of the market for years, so it’s no surprise that one of their premier models takes the first place among the best rated ceiling fans. The 53091 Builder Deluxe is a fan that combines the elegance of the 19th century designs with the 21st century efficiency. It’s beautiful and can enhance your interior due to its exquisite bronze finish and Brazilian Cherry/Stained Oak blades. The Builder Deluxe is a truly luxurious device, but its price isn’t too high and hence its one of the best ceiling fans with lights. In fact, this fan would make an excellent investment as it can help you cut down your cooling costs by up to 47%. The product features a top-quality Whisper Wind motor with three speeds. As its name states, the device is quiet as a whisper, so you can enjoy the cooling breeze from the fan without getting annoyed by the noise it makes. The motor comes with a limited lifetime warranty, so you can be sure in its quality. This fan is extremely flexible and features a 3-position mounting system that allows you to install it in any room. It has a light, so you can use it as the central ceiling fixture. The frosted glass bowl provides soft lighting that creates a cozy atmosphere in the room. 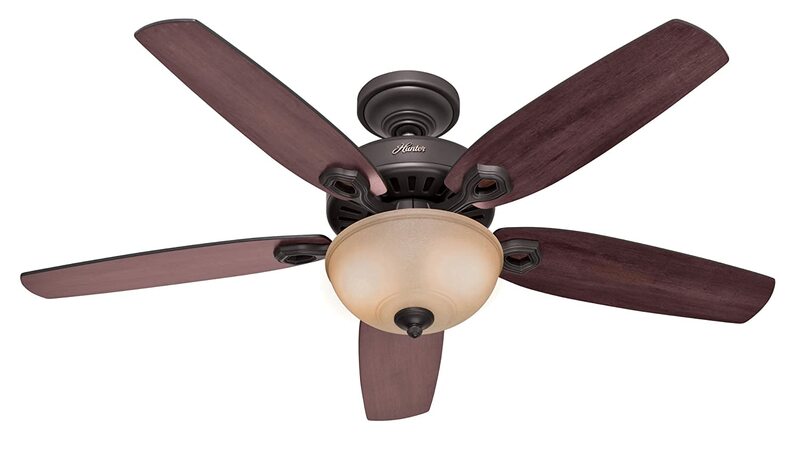 The Builder Deluxe is one of the best rated ceiling fans on the market and has hundreds of glowing reviews. People state that its quality is extremely high and it offers great value for your money. Some users complain about the slight wobble of the fan at high speeds, but this problem is easily solved with a balance kit (included in the package). Check out the current Amazon price for the Hunter 53091 Builder Deluxe. The 51059 Low Profile IV from Hunter Fan Company is the perfect device for you if your room is relatively small with a 7-8 feet ceiling. It would be able to cool a room under 100 square feet quickly and efficiently, helping you to save money on air conditioning. The Hunter signature Whisper Wind motor ensures is so quiet, you would hardly hear the fan working. The Low Profile IV design is sleek and elegant. The beautiful white piece would look great in modern and minimalistic interiors, which definitely explains why this particular model takes place among the best rated ceiling fans available today. According to reviewers, this fixture is a great addition to any home. People love its design and quiet power. Users comment that installing the device is rather easy, so you won’t have to hire a professional to do this. There are a few complaints about incompatibility of the device with certain lighting kits. You can avoid this problem by consulting the Hunter customer support service before buying lights. Take a look at the Hunter 51059 on Amazon. Small, beautiful, and efficient are the best words to describe this outstanding model from Minka Group Company. It takes place among the best rated ceiling fans due to its high quality and stylish design. Seemingly plain, the F518-WH is quite powerful, and it features an excellent halogen light that will effectively illuminate your room. Note that this device is developed for small rooms with low ceilings. Three top-quality blades and a powerful motor will get the air moving fast and keep you pleasantly cool. You can control the fan remotely and choose between 3 speeds in both forward and reverse. Use the second option to move warm air down from the ceiling during winter and cut down on your heating costs a bit. The reviewers like that this low profile ceiling fan is powerful and affordable, yet it looks like a premium-rate product. The motor runs so quietly, you can install the piece in the bedrooms. Some of the users dislike the lens included in the kit. However, you can forego it completely and use the device as fan only, installing other lighting fixtures in the room. This is also one of the best outdoor ceiling fans with lights. Find out the Amazon price for Minka-Aire F518-WH. One of the best-selling fans on the market, the 7861400 Industrial from Westinghouse is a device that can be called a ‘classic beauty’ among these fixtures. It’s a beautiful 56-inch ceiling fan with thee blades and nickel finish. The device provides efficient airflow (7.105 cfm) maintained by a powerful motor. The 5-speed control allows you to maintain perfect temperature in any weather. 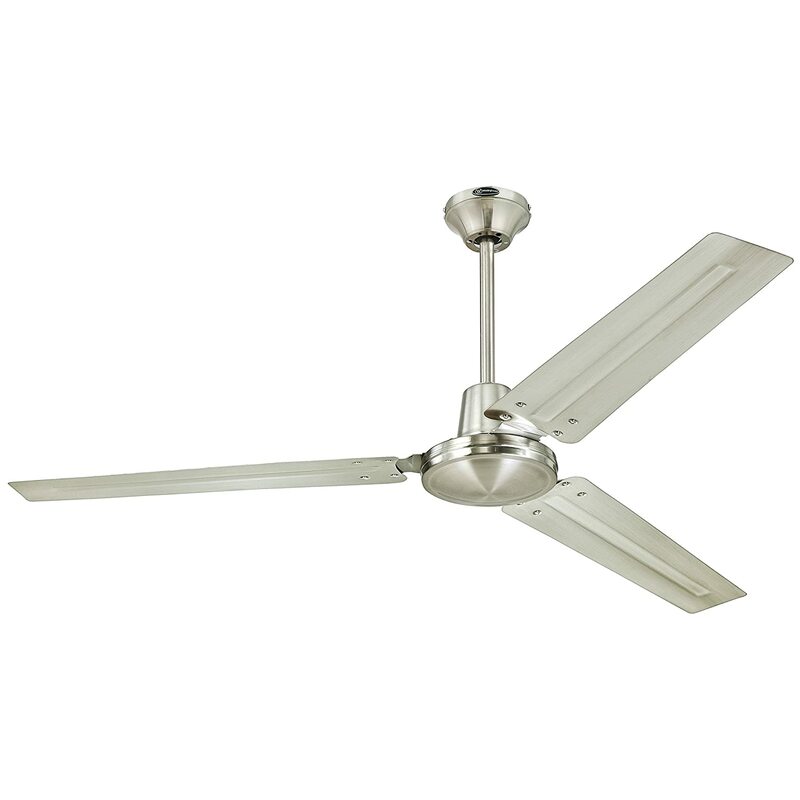 The Industrial is one of the best rated ceiling fans due to its power. It’s so efficient, you can install it at commercial properties. However, its stylish design will integrate just as well into a modern residential interior. Note that this piece of equipment is fairly large and requires at least 10-feet ceilings. The vast majority of reviewers agree that this is an exceptional fan, and that it’s perfect for keeping large rooms cool. The quality of the device ensures it will serve you for years to come, and it requires very little care as all parts are made of metal. There are a few complaints about the control panel design, but it’s a matter of personal tastes. Check the Amazon price of the Westinghouse Industrial. 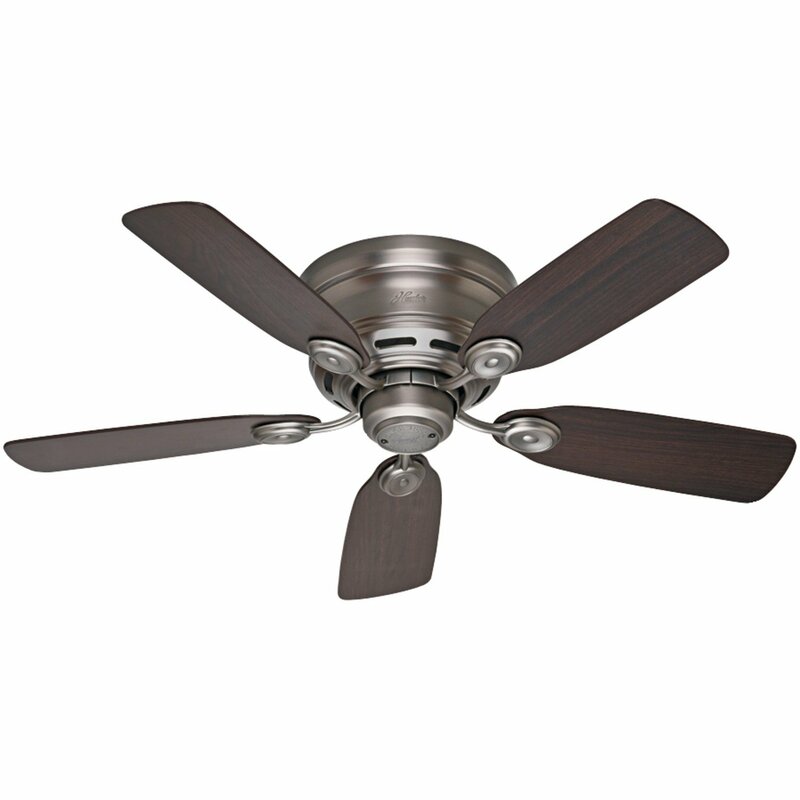 The Comet is one of the best rated ceiling fans from Westinghouse, a renowned producer of these fixtures. Its 52-inch blades will keep even a huge room pleasantly cool on a scorching summer afternoon, so installing the device will help you cut down on air conditioning. The fixture is reversible, which means that you can also use it during winter to let the warm air circulate more efficiently and save up on heating costs as well. The Comet is also equipped with lights and would make a wonderful lighting fixture for a contemporary interior. Westinghouse is one of the top manufacturers on the market and their motor for the Comet comes with a lifetime warranty. Other fan parts have a two-year warranty. Note that this model is available in 4 different colors, so everyone would find the perfect fan for their home. This fixture is a good choice for rooms up to 360 square feet. According to reviewers, the Comet is quiet and highly durable. People often complement its stylish design. If installed properly, it doesn’t wobble and works without a hitch. A few people dislike the look of control pulls and the fact that there are two separate ones (one for lights and one for the fan). This is a matter of personal tastes, though the pulls are hardly noticeable. Find out the current price of the Westinghouse Comet on Amazon. The F844-DK won its position among the best rated ceiling fans due to its original and beautiful design. This fixture is not only efficient for keeping your room cool, it’s amazing piece that enhances the interior of your room. This elegant piece of equipment with Distressed Koa finish, comes with a powerful motor and a 3-speed remote control. It’s also equipped with a light and the remote has a light-dimming function. Owners of this fan commend its looks and the fact that it comes with energy efficient LED lights. This piece is highly affordable, but its quality puts it firmly among the top products on the market. The only downside of this model is that you need to switch it to the reverse manually. The switch is located on the motor, but it’s easy to find and operate. Learn more about the F844-DK and its Amazon price. If you decide to buy a ceiling fan, start with assessing your room size and design. There are many best rated ceiling fans available today, so you will definitely find something that would meet your needs and budget. The vast majority of models are very flexible and come with varied mounts, so you can install them in almost any room. Therefore, it’s design that would be the most important consideration. Study your options carefully and be sure to look into some user reviews to learn what people have to say about these devices. This way, you sould be able to find the perfect ceiling fan for your room.